The U.S. freight rail network moves the raw goods and finished products that fuel the American economy, from the materials that generate electricity to power businesses to the consumer goods filling shopping carts. This critical, efficient and cost-effective network is the best in the world thanks to railroads’ billions of dollars in annual investments. The U.S. Department of Transportation expects total freight demand to grow 37% by 2040, which means the improvements made today are even more important for world-class service tomorrow. Privately Owned: The vast majority of America’s freight railroads own, build, maintain, operate and pay for their infrastructure with little or no government assistance. Capital Intensive: Railroads spend an average of 19% of revenue on capital expenditures, six times more than the average U.S. manufacturer. Sustained Investment: Railroads privately spend an average of $25 billion annually on infrastructure and equipment. Self-sufficient: Smart public policy gives railroads the ability to earn the revenue required to maintain and modernize the nearly 140,000-mile rail network. Economic driver: The net economic effect of freight rail’s operations and investments is profound; In 2017 alone, U.S. freight railroads helped spur $219 billion in economic activity and supported approximately 1.1 million jobs across the country. From automakers to homebuilders, manufacturers and utilities, nearly every goods-related industry relies on rail to get its products to market in the U.S. and beyond. Average U.S. freight rail rates (measured by inflation-adjusted revenue per ton-mile) were 46% lower in 2017 than in 1981. This means the average rail shipper can move close to twice as much freight for about the same price it paid more than 35 years ago, which helps American businesses stay competitive in the global economy. This essential network also enables railroads to haul one-third of all U.S. exports. In fact, 42% of rail traffic and 50,000 domestic rail jobs, worth $5.5 billion in annual wages and benefits are directly associated with international trade. Thanks to freight rail’s investments in innovative technology, operations and infrastructure, recent years have been the safest in rail history. Cutting-edge rail tech — from smart sensors and drones to advanced data analytics and training simulators — is applied to nearly every aspect of rail operations to enhance safety and drive efficiency. 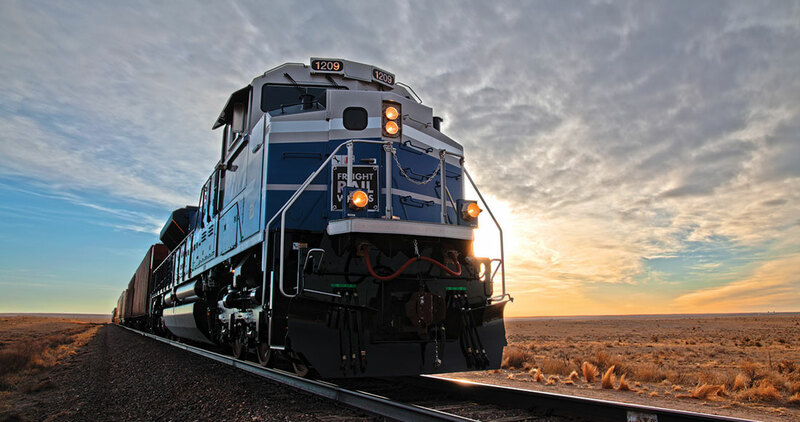 U.S. freight railroads are also actively implementing Positive Train Control technology, which automatically stops a train to prevent certain types of human-caused accidents. This, coupled with sustained investment in infrastructure and equipment — to the tune of more than $685 billion since 1980 — has helped reduce the train accident rate 23% since 2008. Investments in greener technologies, improved freight car designs and more efficient locomotives have helped railroads reduce their energy consumption, pollution and greenhouse gas emissions. According to AAR data, railroads can move one ton of freight an average of 479 miles per gallon of fuel and they are four times more fuel efficient than trucks. That means that moving freight by rail instead of trucks reduces greenhouse gas emissions an average of 75%. The American Society of Civil Engineers awarded the rail network a B, the highest grade in its 2017 Infrastructure Report Card. The high mark for America’s privately funded freight rail system stands in stark contrast to aging taxpayer-funded highway infrastructure, such as bridges and roads. With a single train hauling several hundred truckloads of freight, U.S. freight railroads’ ease the burden on the nation’s overcrowded highways — and the taxpayers who pay for them.